This page is for those mostly pre-owned models I’ve spotted that are attractive to me, possible contenders for collection or featured as simply watches I like. 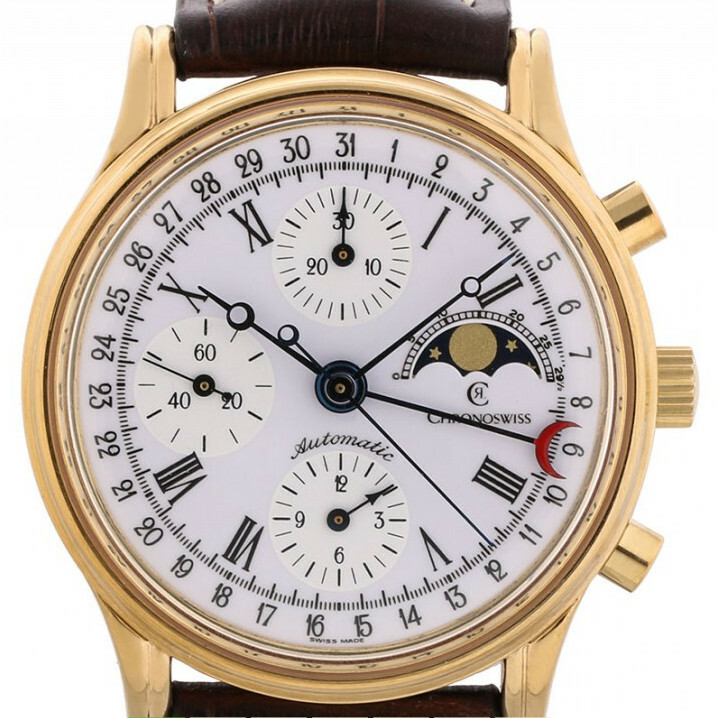 The first is this lovely and classic Chronoswiss Kalender Chronograph Moonphase Steel and Gold Automatic, which is good value at the offered price of £1345.00 or thereabouts. It’s a neat size at 38 mm diameter and good quality Swiss Automatic movement. Excellent condition with it’s original quality leather strap with signed buckle, this is a very decent watch for any collection. 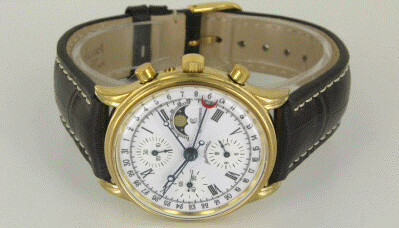 Chronoswiss watches are from German watchmaker Gerd-Rudiger Lang of Munich, though now also based in Lucerne who appeared around 30 years ago. They produce a wide range of well priced classic themed models from the relatively simple to the rather (and for me often over) complicated – and at an affordable price point. I particularly like this model as it doesn’t over play the “classic” chrono constructions which often feature “oversize “onion” crowns, over-fluted thick case styles and function complications that I feel just add unnecessary clutter. This is as classic as I like and has a case shape more in keeping with a wrist watch as opposed to the odd pocket/wrist concoctions I’ve seen, which whilst appearing to be the true vintage ideal, simply don’t appeal to me. This is nicely conservative with a small c, is neat with a clear white dial and with a small case depth and diameter and yet manages to have decent legible classic complication features with usable functionality that I’d expect from a classic watch. Certainly worth a second look.